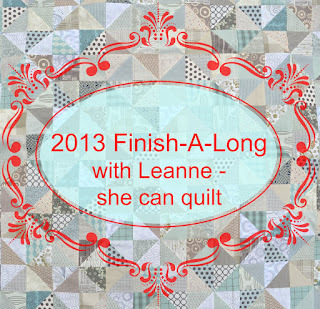 Have you been participating in the Finish-A-Long for 2013? This is the last quarter, of course, but it's the first time I'm linking up a goal list. My list is pretty modest compared to some I have read, but it still feels like a ridiculously long list to me. The great thing about the FAL is that there's no pressure, so I'll finish what I can and then the rest will just move onto my goal list for the first quarter of 2014's FAL. 1. Mom's Christmas present. It's really coming along. I'm removing papers from the paper-pieced portion now, so it should be finished soon. Sorry, no pictures, for obvious reasons...Hi Mom! 2. I've signed up for the 'For the Boys' Blog Hop in November at Sew We Quilt. The project is picked out, fabric is bought, I just need to get sewing. Since my day to share is November 12 this should be a no-brainer to be on my finished list. 3. I've also signed up for the Fall Mug Rug Swap, so I have two fall themed mini quilts to make. Since they have to be in the mail (to Australia!) before the end of the month, this should be another guaranteed finish. 4. My And Sew On quilt. I want to use 5 of Kristy's blocks, but so far only 2 are done. I'd love to have this one done and hanging where I can enjoy it rather than tucked away in the WIP bin, but I have a feeling it will still be on my list come January (hopefully with fewer blocks left to go at least!). 5. A baby quilt for a friend due next month. This is a quick, one evening project, but I think I'll wait until after baby is born so I know if I'm making it for a boy or a girl. 6. My poor, neglected Scrappy Log Cabin quilt. This one hasn't had much attention the past few months and I would love to get it finished. It's looking so pretty and would look even better without all the safety pins and with a binding. Considering how much is left to be quilted, and all the other projects on the go, this is the one that feels the most ridiculous and I almost didn't even include it. Then I decided I might as well aim high, right? Looks like there will be a lot of sewing in my future! Towards that end, I'm off to set up my machine, right after I link up this list. Lots on your list. You can do it! I really love your scrappy log cabin.